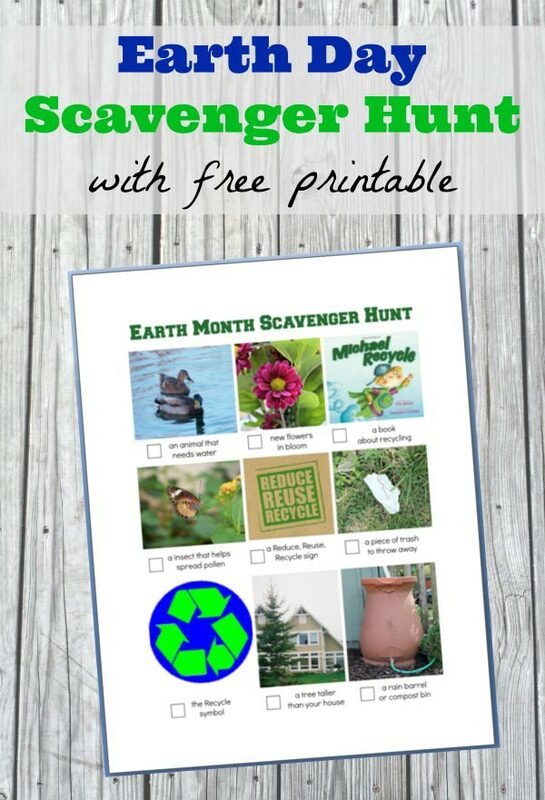 Grab this free Earth Day Scavenger Hunt printable activity and inspire kids to learn more about our environment! April is a great time to teach our kids about going green -- learning eco-friendly behaviors, watching movies with environmental themes and ways kids can help the Earth. When we were young, environmental issues weren't as well discussed or researched -- now, our kids learn about them in school as part of the curriculum and are inspired to do small things that will benefit the Earth. Today's activity -- an Earth Day (or Month) Scavenger Hunt -- mixes both the How & Why of choosing to 'go green'! 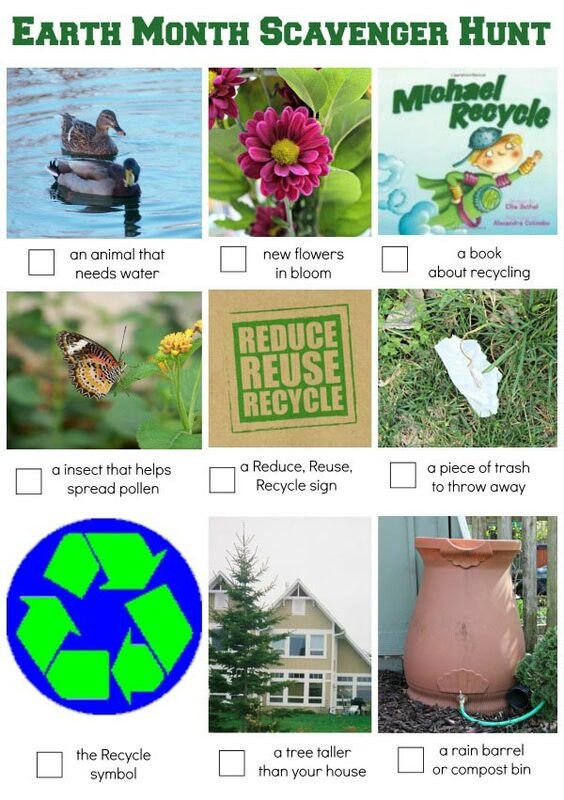 The goal of this Earth Day scavenger hunt is to not only find the items listed but also discuss how they relate to being eco-friendly. We're including links to Earth Day activities along with affiliate links for items items we've found useful when discussing the topic -- plus a FREE printable for you too! As we introduce environmental behaviors to our children, it's not only important to teach them HOW to do the behavior (such as recycling a plastic bottle) but also critical that we share with them WHY we are doing these things. Why do we sort out our recycling? Why shouldn't be let the water run when we brush our teeth? We sometimes miss the opportunities to discuss the impact our behaviors can have on the world around us. Why Should I Recycle? is a great book for teaching kids the "why"
And both I Can Save the Earth and 10 Things I Can Do to Help My World are perfect reads when talking about the "how"! As you can see, some of the items pictured can easily be connected to the "HOW" we protect the Earth (throw away trash, look for the recycling symbol before throwing something away, etc). Other pictures show more of the "WHY" we want to adopt these behaviors (so insects can help pollinate plants and we will have trees taller than our house). For example, one of the items listed is "an animal that needs water" -- that's kind of a tricky statement, isn't it? 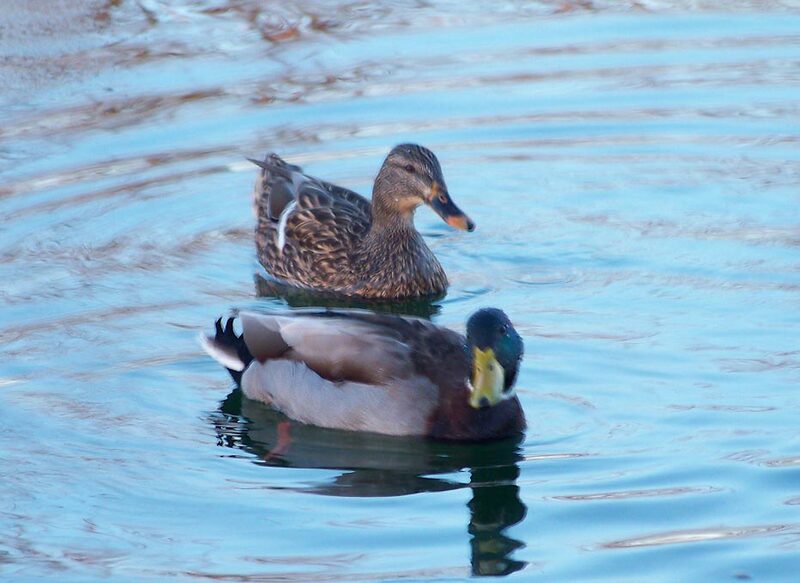 ALL animals need water whether it's to drink, bathe or use for swimming -- which is a great point to discuss with kids as they search for an animal who needs water. Older kids will be able to 'school' you on the water cycle, I'm sure ;) and how we can all help to keep the water clean and usable for animals. Don't have a rain barrel yet? Here's a great selection of rain barrels (they ship right to your door!) if you're considering one for your yard -- we've been SO pleased with ours as now the kids don't have to drag the hose around the water the garden! 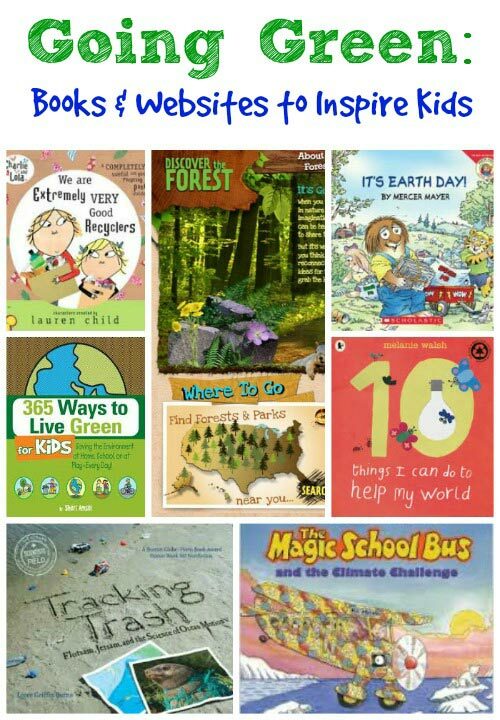 If you want to dig deeper into a few of these ideas with your kids, try this list of books & websites about ecology & the environment. We titled the hunt an "Earth Month Scavenger Hunt" because it might take more than a day to find them all. Kids can complete it over the course of a week or during the entire month of April. and encourage your kids to be observant as they learn, play and explore this month! Books are always a super start to introducing kids to new topics. Many times, a story will spark kids to become more aware of how to be earth friendly and also why we should all adopt these behaviors. For more of the "Why", check out these books about biomes and animal habitats. And here's a great movie list too -- 10 Family-friendly Movies for Earth Day! And be sure to visit Kitchen Counter Chronicles to learn What is a Carbon Footprint? -- very eye-opening activity for kids! We're celebrating Earth Month with many of our blogger friends! 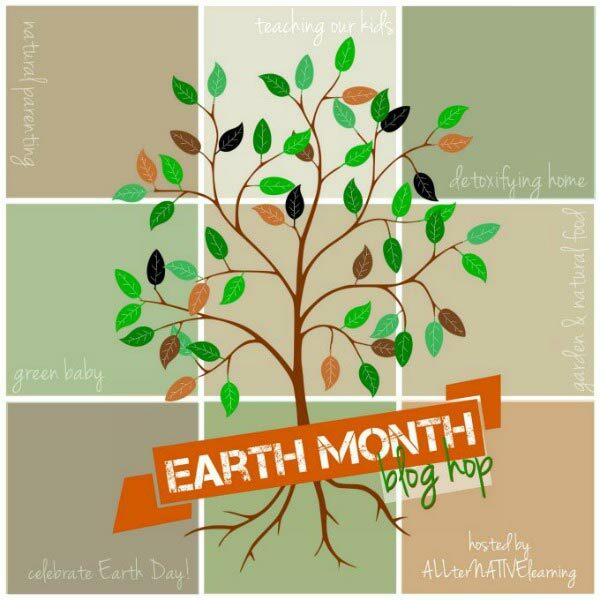 You can find 100's of eco-friendly ideas for families on the main page of the Guide to Natural Parenting & Earth Month on the Alternative Learning blog! Great printables! Children should really be taught about things concerning our environment. This is a fun way to celebrate Earth Day.